Backpackers, travelling through Europe, forged a new wave of international collaboration. In the years following the Second World War, western Europe, through private and public initiatives, invested significant resources on its young people, encouraging them to travel and to welcome contemporaries from elsewhere. They did this in a variety of ways. National youth hostel networks were established, then expanded and transformed, which encouraged travel; international work camps were formed, where the young could labour for the reconstruction of Europe in fraternal camaraderie; and the European Youth Campaign was founded, aimed at uniting the Continent through the abolition of border controls. These endeavours, which encouraged young people across Europe to visit and engage with other nations and nationalities, were intended to help western Europe recover from the violence and the hostility of the World Wars. Youth hostels first appeared in Germany just before the outbreak of the First World War. The concept spread rapidly to other European countries in the 1920s and 1930s, where they became national associations intent on promoting their home countries to their young citizens. After 1945, however, hostelling became an international phenomenon. Youth hostelling became less and less about countryside rambles and more and more about foreign travel. In western Europe between 1946 and 1960, the number of youth hostels doubled, the number of hostel association members tripled, the number of hostel beds quadrupled and the number of overnight stays in hostels more than quintupled. By the end of the 1950s, hostels were becoming predominantly international spaces: overnight stays in hostels by visiting foreign members outpaced those of domestic ones. The young began to travel in greater and greater numbers, using and shaping the development of the vast infrastructure of youth hostels to support their trips by rail, bicycle, even hitchhiking. The frequency of their travels and the routes of their itineraries brought them into contact with others from the western half of the Continent. Whether part of organised exchange groups or as independent hitchhikers, these young travellers began to see themselves as a coherent group with shared interests. While their interactions were informal, the coming together of young people on such a scale proved highly influential. By the 1960s, a vast new travel culture had emerged, which helped transform western Europe into a more democratic and ‘Europeanised’ social space. This became especially apparent half a century ago, when a ruinous flood deluged Tuscany. Overnight on 4 and 5 November 1966, the River Arno broke over its banks and flooded Florence, leaving one ton of mud for every person in the city and devastating the Renaissance city’s artistic and historical treasures. Churches, museums and libraries, all filled with works of art, were inundated with mud, to a depth in some places of 22ft. Young people, arriving from across the Continent, immediately began showing up to help. They became known to the Florentines as gli angeli del fango, ‘the Mud Angels’. 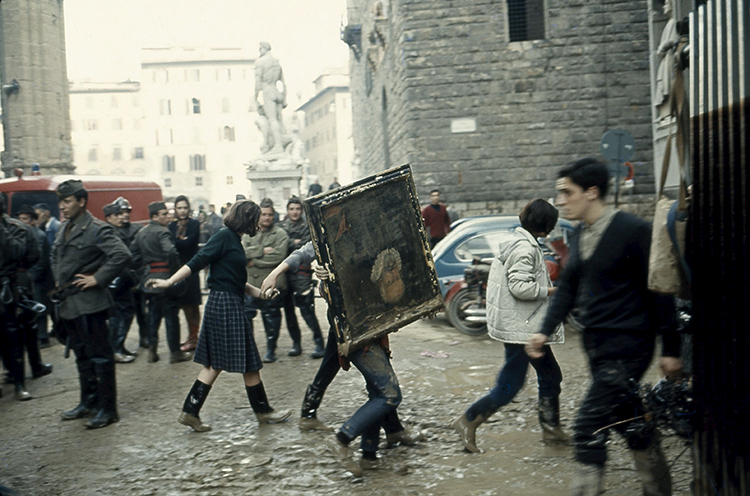 A monumental task: volunteers carry a painting to safety past the replica David in the Piazza della Signoria, 1966. 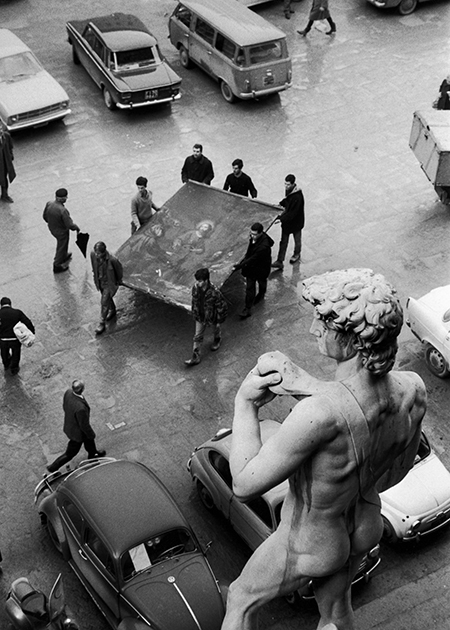 Throughout the winter of 1966-67, young volunteers kept arriving to help clean up Florence. Many of these were Italian, but a significant number came from further afield. They cleaned mud out of the Basilica di Santa Croce, carried priceless paintings out of the Uffizi galleries and brought food and fresh water to the elderly Florentines trapped in their upper-floor apartments. These youthful workers were not organised, nor had they been recruited. They simply turned up. Young Europeans dropped what they were doing and boarded trains or drove south. Many had already been on the road, backpacking around Europe, and simply rearranged their itinerary to spend time in Tuscany. The mayor of Florence, Piero Bargellini, already overwhelmed with the disastrous state of his city, had to scramble to accommodate them as the local hostels quickly filled up. He arranged to house the incomers in idle sleeping cars and coaches in the city’s main railyard, set up a central office at the Uffizi to dispatch them daily to the places where they were most urgently needed and managed to organise a canteen to feed them in the kitchen at the Galleria dell’Accademia, where Michelangelo’s David is housed. One Florentine commented that, even before soldiers arrived as part of the official government response, ‘the city was already in the hands of the young’. There was a tremendous turnover in the winter months. Some Mud Angels stayed a few days, others a few weeks. They listened to the latest music while working, smoked cigarettes on their breaks and had only a little energy left for carousing at night. Because of the polyglot nature of the young workers, the archivists and preservationists had to devise a colour-coded card system to track and process each item. It is unclear just how many Mud Angels there were in total, or even exactly where they had come from. There were probably only a few thousand of them at most, yet, given their mythic status in Italy, one would think the number was ten times that. The Mud Angels of 1966 were an expression of the internationalist instincts, transnational travel and generational solidarity that had developed out of the new-found postwar mobility of the youth of western Europe. In the decade and a half after the Florentine Mud Angels, mass youth travel in Europe developed into the kind of cultural form of travel that flourishes today, complete with rail passes, guidebooks and backpacks. Contact between young Europeans grew, helping to build new connections across borders. European integration is often described as a top-down affair, but a cultural history of postwar travel considers the story from the bottom up, revealing the interaction between state policy and social activity. While these backpackers were not ambassadorial in the sense of acting in the direct service of the state, their interactions and mobility suggest a new and different kind of international relations. Richard Ivan Jobs is a Professor of History at Pacific University in Oregon and the author of Backpack Ambassadors: How Youth Travel Integrated Europe (Chicago, 2017).